Once you step out of your home, you simply can’t deny that christmas is in the air. All the supermarkets, stores and malls are dressed in beautiful red and green. The music and the variety of goods on display only adds to the charm. Having gone to a convent school, we celebrated christmas every year with carols, christmas decorations replete with a tree and of course cake! This year I would be celebrating christmas at home with my toddler, his friends and their mothers. This means that there is a lot of baking in tow for me, the following week. With so much of christmas everywhere, I planned to kickstart the season with this rich fruit cake. Indeed, I have a weakness for fruit cakes. I simply love how the dried fruits and nuts, spices, flour and sugar magically transform into a delectable piece of cake sure to win hearts and minds of those around. This cake is rich in flavours and filled with fruit in every bite. I used a combination of dried cranberries, black & golden raisins, currants, dried apricots and dried figs with walnuts and cashews. Since I didnt have citrus peels on hand, I grated the zest of an orange into the fruit mixture. All these fruits together created real magic in my cake. The man of the house with discerning tastes relished the cake and gave his thumbs up which I must say makes me happy each and every time he does it. I feel blessed to have a very happy and cheerful baby. But like all babies, he is prone to those “cling to your mother” days once in a way and wont relax unless I hold him close to my heart, cuddle him and keep him entertained. As I put him to nap in the afternoon and stepped into my kitchen, rearing to go with all the excitement, feeling happy with the gorgeousness and colour of the fruit and right after I had mixed the dry ingredients into the wet, the alarm bells came calling and my boss was up! My baby had chosen this day to be one of those days when he needed me and would not settle for anything else. This meant that I didnt have time to decorate the cake and had to rush with placing the almonds over the cake and I somehow managed to shove the cake into my oven and rush to him on time. This also meant that I didnt have much time to style and shoot. The travails of having young ones on hand! But one smile from that angelic face that lights up our days, those endless innocent babbles and it all seems worthwhile and I feel like sacrificing thousand such endeavours for the contentment and well being of my child. 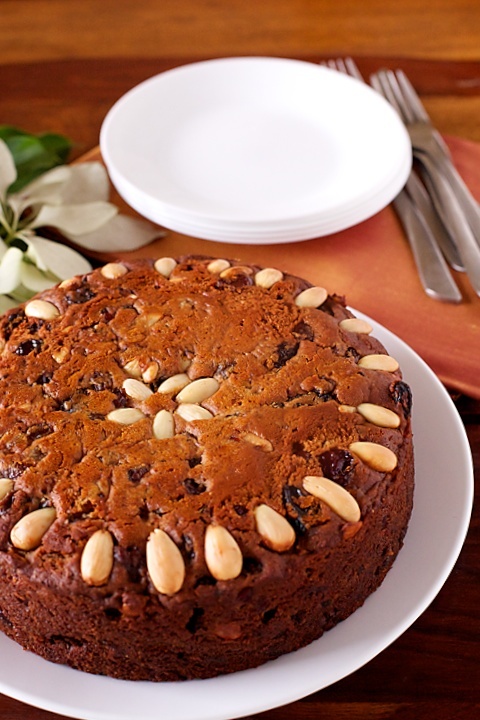 This fruit cake is great not just for christmas but for any special occasion. You could ice it with fondant to make it even more special but I prefer to leave it as it is and let the glories of the fruit take over. One word of advice, allow the cake to completely cool before slicing it. This will make the cake firm up and prevent breaking. Infact, it is best left overnight for the cake to firm up and develop flavours before it is sliced up and relished and transports you into “fruit cake heaven”. You could use your favourite dry fruits here, but this combination ups the flavour quotient to the maximum. This cake, adapted from Great Vegetarian Dishes by Kurma Das keeps well, so it is one of the best recipes to prepare in advance. Potato starch is a common ingredient found in egg replacers and the potatoes here act as a binding agent and you can't detect its presence in the cake. Replace the butter with vegetable margarine or oil for a vegan version of this cake. Grease the base and sides of a deep 8” (20 cm) round cake tin with the melted butter. Line the base with greaseproof paper. In a large bowl, combine the flour, baking powder and 1/4 tsp baking soda, mix well and sift once to make the mixture uniform. In a medium sized saucepan, combine the dried fruit, sugar, butter, syrup and water and heat slowly on low heat, stirring, until the sugar dissolves. Increase the heat to medium and allow the mixture to come to a boil, reduce the heat and then simmer for 20 minutes on low heat. Remove the sauce pan from the heat, mix in the 1 tsp baking soda and allow to cool. Spoon the cake batter into the prepared tin and smooth the top with the help of a spatula. 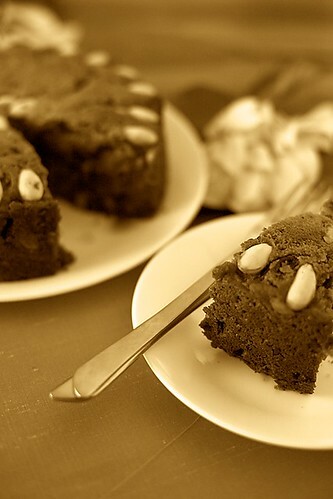 Decoratively arrange the almonds over the top of the cake. Cover the cake with aluminium foil and bake at 180 degree centigrade/ 350 degrees F for 1 1/2 to 2 hours or until a skewer inserted in the centre of the cake comes clean. Once the cake is done, allow the cake to cool completely in the tin. When the cake has cooled, place the serving plate over it and turn it upside down. Carefully remove the paper, turn it over again with the help of a plate and serve. If possible, allow the cake to mature over night or atleast for 4 to 5 hours before slicing it up. Wonderful Anu !!! Cake looks decadent, it reminds me of plum cake available at Bangalore bakery. That is such a lovely cake, Anu! If you hadn't mentioned that it was eggless, no one would guess it! The cake looks so rich and so inviting. Great work Anu! How do you keep the dry fruits and nuts from sinking?! Thank you everybody. You are so right Ria…people who taste it also feel the same. Esha: In this recipe the fruits are cooked and they are dispersed evenly in the batter, if the recipe is followed so there is no chance of the fruits sinking. 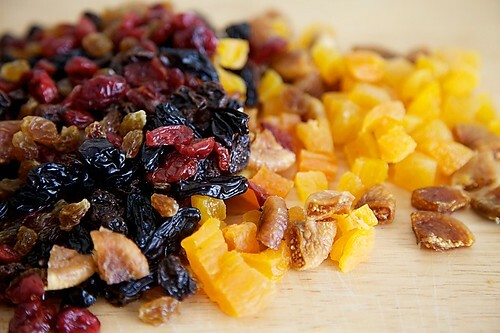 In other recipes requiring dry fruits, make sure they are completely dry before you fold them into the batter. You might want to coat them with flour to prevent them from sinking to the bottom. The cake looks gorgeous. I love fruit cakes too, whihc reminds me I need to bake mine soon!! I'm guessing the mashed potato is to make up for the egg? Avanika: Yes, like I said above in the head note, potato starch is a common ingredient found in egg replacers and the potato here acts as a binding agent and you can't detect it in the finished cake. amazing looking fruit cake, this season is all about fruits in cakes! I absolutely love the colour,can't agree more to the above comments.It looks straight out of a bakery,even better.Last year I tried out your Fruit Cake recipe for my amma who doesn't eat eggs and who hadn't tasted a fruit cake till date.I am sure this one's a sure shot winner too!! Ajji: I have no words at all. 'Anmol' in her exact words. Amma: I want a bite RIGHT now. Dodamma: My mouth is watering! Me: It looks absolutely delightful, and indeed very christmasy. What an amazing looking fruit cake. Thank you for posting I'm definitely going to make it for my dad who tries to avoid eating eggs at all costs…cheers! What is this allspice powder. I am new to baking and would like to know what it contains. hey,This cake reminds so much of the plum cake of Nilgiris( they are famous for plum cakes and cake exhibitions in bangalore). I wish it were real. It looks good without much dressing. I'm trying this christmas and you've mentioned baking soda twice in the ingredients. pl. clarify which measure to be taken. asha bala: If you read the recipe properly, you will understand that the first part of the baking soda is for the flour and the second one is for the fruits. Hope this helps. Let me know if you have further questions. Happy baking! I hope I am here for the first time , sorry I am not sure anyway such a gorgeous cake that too eggless. Awesome !!! I have bookmarked it and thanks for sharing it.. Do peep in mine to see the christmas treats when u find time. Hey Ur profile picture is awesome and u look like an actor Ambika in the profile picture.. so pretty. thanks for this wonderful recipe …i just made it for the christmas today!! and its awesome!! I tried this yesterday and it was just awesome..posted in my blog..just to let you know and thanks a ton for a nice eggless recipe..
can we reduce the fruit quantity? if yes, then what about flour and other ingredients, will they remain same? paramjeet: I havent tried this recipe with reduced fruits. If you want to reduce the fruits a bit, I would suggest increasing the sugar a little. All the other ingredients as well as the flour could remain the same. Awesome! Finally my quest for an eggless fruit cake (without the alcohol!) ends here! First time here and I am floored by the photography and presentation leave alone the recipe collection and writing skills..shall visit often. Hi Anu, could i replace the potatoes with sweet potatoes? Thnx in advance. Sheela: I havent tried this with the sweet potatoes, but I think it will alter the texture and the taste of the cake. Good luck! Can i use a microwave oven instead of a regular one ? Parag: I never bake in a microwave so I can't give exact directions for the same. Rajes: Great that you and your mother love this cake! It is so rich in flavour and delicious! Khushboo: You can substitute the potatoes with a cup of cooked and mashed/pureed pumpkin. This is a fantastic cake. Really delicious and worth making. Brilliant. can we use lemon zest instead of orange zest and when should we add it??? Nikki: Yes you can! Add it along with the spices and vanilla. Have just put it in the oven – a quick question – just how thick is the batter suppused to be. I added a bit of water to help with the folding of flour, even though I have endeavoured to follow your recipe completely (including simmering time, weight and measures of the ingredients) I fear it may not come out well because of the 3 tbsp of water. Preet: Hope your cake turned out well! The batter is supposed to be thick here as we are using cooked potatoes. Additional 3 tbsp water would make the batter quite loose. It is important to follow instructions precisely for perfect results in baking. Anu – Thank you for this recipe, I will be making this soon! Uma: Technically speaking, I think it might work. Since I havent tried it, I cant vouch for it. Let me know if you happen to try it with potato starch. Shuba: You cant substitute allspice with garam masala since it may have cumin, coriander and other spices which wont go well with the cake. You can use cinnamon, clove and nutmeg powders as a substitute for allspice. Hey…I made this today and it came out perfect. I am a fruit cake fan and this cake didnt disappoint me. I added some candied orange peel and few changes in the dry fruits. Otherwise followed your recipe to the T and its just awesome. Thanks for the suggestion on the all spice powder. It worked. Merry Xmas and happy new year to you and your family. I made this cake for my friends b'day yesterday and covered it with fondant…excellent…great taste no one missed the egg…thanks..great job..love ur writing style..good luck n keep going..
thank u so much for the great recipe .. just popped it into the oven .. i just had one issue the batter was almost to the consistency of roti dough after following the recipe perfectly .. i had my doubts and wanted to add water but refrained from it after seeing ur previous comments .. is it supposed to be that think or can it use a bit more of liquid?? what might have gone wrong?? Hi Anu..Merry X-mas to you and your family..! 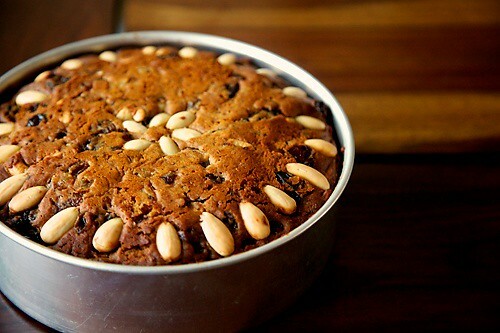 !Made this and the eggless fruit&nut cake…both came out perfect..absolutely divine..!! I was delighted to see modification of Kurmas recipe by U. I am confused at the use of sugar by Kurma and use of Demerara sugar by U.Mr Kurma and U both heat, melt and simmer sugar for 20 minutes. Does Mr Kurma mean Brown sugar when he refers to Sugar???? I got a very good plum cake following ur recipe. Thanks. I would like to send photos of my cake. Pl send mail id for that.I req u to visit youtube to watch my Rasgulla videos in 2 parts.I want to know–What was the purpose of adding Soda to dry fruit caramel mix? Has it any role in preventing caramel from being hard when cooled at room temp? Mr Kurma recommended 1 cup pl flour and 1 cup self rising. I was worried about self rising flour as this will not be easily available.Ur recomm. for 2 cups of flour was easier to follow. I wanted to know—How did u calculate baking powder and Soda bicarb while replacing self rising flour with pl flour? Sorry for so many queries. One last Q–I couldnt get Golden syp at Ahmedabad.What does it do to cake? I added jaggery syrup on adv of Mr Kurma das. This cake looks divine! Just a couple of questions, if I make the all spice powder at home, do I need to dry roast the spices before powdering them? Secondly, can I substitute the golden/maple syrup with honey? Devi: You can dry roast the spices (do not over roast) to release the flavour. I do not recommend cooking with honey as according to Ayurveda it creates toxins in the body. Use Jaggery syrup if you dont have golden syrup. Dr. Rajesh: I somehow missed replying to your comment and am sorry for the same. The soda is to make the cake rise. The mixture is not cooked to caramel consistency. I generally follow the rule 1 cup self raising flour =1 tsp baking powder and 1/8th tsp soda, but modify it according to the recipe. Jaggery syrup is a great substitute. Golden syrup adds to the flavour and texture of the cake. Soda was added to flour for cake to rise. But why in dry fruits? After heating these with brown sugar, and cooling soda is added. Quick question about the mashed potatoes – do we cook and mash them or just purée the raw potatoes? LOVE your blog!! Great job!! Hi Anu,This one was there on my wish to to since long,got to bake it yesterday,The result is just awesome,and melting soft cake.. It is really great to find your blog. Bhuvana: So happy you liked this cake. Thanks for your feedback. 1> After adding baking soda to the cooked mixture it erupted like a volcano :)..Is it normal? 2> By an hour or so the cake was done. I baked it for 1 hr 15 minutes. The cake had burnt after taste. Just wanted to confirm the baking heat. Is it 325F or 350F? Vidya: You have to get bubbles after adding the soda to the cooked mixture. Erupting like a volcano is something unusual. Are you sure you didnt add excess soda? The baking temperature is what is specified in the recipe and has given me and many others the desired results. There is a lot of variation in temperature if your oven is not calibrated properly. You can try baking it for less time and see if its done if you happen to make it the next time. 1. What is the reason of adding the mashed potato.does this support the cake. 4. also if i am using eggs, what other ingredients should i reduce on. sorry to bother u with lot of questions. going to do this for the first time. so a little nervous. thanks. Joy: Mashed potatoes are used here in place of eggs. Tuti fruit need not be cooked but this recipe involves cooking the dry fruits and making a syrup out of them. Yes you will still need to cover as this will stay in the oven in a long time. Sorry, I don't bake with eggs! my cake sank in the middle after being removed from oven although the toothpick in the middle came out clean how could it be prevented? Hi Anu..been wanting to write to you since long to tell you bout my experience on this cake.The Cake came out fabulous. This is the first time i tried out an Eggless Recipe, & I just simply followed your measurements & directions (Except i didnt cover the cake in the oven).It was an awesome cake. The batter was a little thick when i mixed it in the end, but i didnt bother much about it, just went ahead & placed it in the oven & what a an awesome cake it turned out to be. Baked to perfection, moist & delicious. Thank you for this lovely Recipe. Now I always refer to your blog for anything Eggless:). A small request, havent come across any Eggless Chocolate cake recipe. do you have any? Thanks. Hi Anu. just wanted to know how long will this cake last, as it does not have alchohol in it. As i want to use this recipe for a wedding cake. This cake keeps very wellas it is baked for a long time. You can easily store it for upto a week. I tried this cake and just posted it…came out super good. Thanks for the recipe! Hi Anu, thank you for this recipe, I am going to try it for Christmas day as I cannot eat eggs. I have tried so many substitutes but have had many poor results due to the flavour coming through in the end so I am looking forward to trying the potato as an alternative in my other recipes too! 🙂 Wishing you a very Happy Christmas from Ireland! Thanks Anushruti for the wonderful recipe;loved baking it as Christmas presents for my friends.Everyone enjoyed it. Will adding cocoa change the whole flavor of this cake ? I recently came across a fruit cake that also had cocoa . I baked this cake today and it has come out well. Tasted wonderful, allaying my fears. Thank you, for the beautiful photographs and detailed recipe. One doubt. I wish to preserve the cake for 6 days. Should I refrigerate it or will it stay fine even if kept outside. I am afraid that the cake will become too hard if refrigerated. Thanks. Glad you all are liking this recipe. Saranya: You can try adding cocoa to this cake for a chocolate flavour. I dont see any harm! Jayashree: Please refrigerate the cake as it might get spoilt if you leave it outside in our hot and humid climate. don't worry it wont go hard as when you bring it out and leave it outside it will soften. 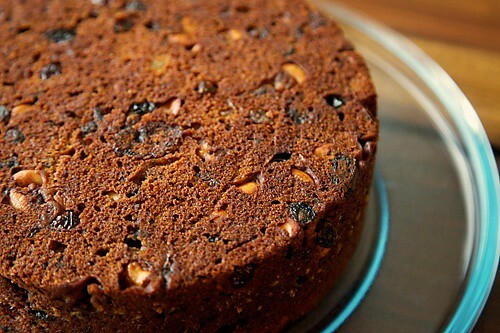 I recently tried a similar eggless christmas cake… with mashed potato as substitute 4r eggs. but my fruit mix got very hard once it cooled down. i tried to cook in a pan adding the cut dry fruits (tuttu fruiti, dates, raisins, figs & aprocits), brown sugar(not demarara but light golden brown), butter(AMUL salted), water and honey(that recipe suggested honey). Can U plz suggest where i could have gone wrong. Is there any care 2 b taken? Neeta: Sorry I overlooked your comment. I have vanilla extract got from the US. You can also powder sugar with vanilla beans to make vanilla sugar. Valli: I never cook with honey as according to ayurveda it creates toxins in the body. Try this recipe and you wont be disappointed. Looks like you overcooked your fruit mixture. Hey Anushruti, I grew up in Kerala and can't imagine Christmas without Plum Cake. This year I could not get the cake & decided to try my hand at your recipe. I am a regular home baker but I had never tried this… Turned out great and my son & family loved it. Thank you! My cake looks a little dry though it tastes fine. Could it be coz of the proportion of dry fruits? Or my addition of light brown sugar instead of Demerara? I'd appreciate your help. Thank you for the prompt reply. Just as you said, I refrigerated it and it lasted for 8 days. I am really amazed. Thank you. Just wanted to write and say your recipes have helped me greatly with eggless baking. I have tonight made your chocolate cake and this fruit cake. They look and smell sensational and I have followed the recipe to a T! The chocolate tastes amazing. I'm not a great lover of fruit so will be taking to my mother to taste test in the morning. Smita: The cake could be dry because of less fat or over baking. The addition of light brown sugar is alright and not responsible for the dryness. shobana: Nice to hear that. This contain flour and is not suitable for Ekadashi fasting. Lisa: You are so magnanimous with your words. Thanks much! Hi there! !..So here I was food blog hopping as usual when I came across urs,thru another site.And ur marble cake caught my attention coz while cakes with chocolate/cocoa can be made without eggs easily,I was yet to come across other varieties/flavors of decent eggless cake.What cinched my decision to try out ur recipe was ur appearance on NDTV foodie(clicked on the link u had provided). I am a silent visitor on all blogs and what made me write to u was to applaud your effort to promote satvik food and also to inform about my success in baking your fruitcake.While I'm a vegtn(I LOVE satvik food),I did not mind baking a cake with eggs in it.So tanx to you now I am going "pure veg";). Coming to your fruitcake recipe,I followed it to a T,except for the addition of a tbsp of cornflour(mashed potato was less than a cup so subbed it with CF)and fruits soaked in rum(I had it at hand and did not not cook it in the syrup).Also halved the butter & added oil in lieu.Although I wouldn't call this the best fruitcake I ever had(I hv had my fair share of cakes,both local & international),it certainly is GOOD,even considering the minor changes I made.All in all I'm a happy baker 2day. I also did my own experiment,an orange & choc cake based on ur marble cake's measurements.Came out well,but could have been better. Sorry this comment is so long.I felt I had to give to an honest feedback.Maybe this will motivate another person to try out ur recipes.Thanks & keep up the good work! How can we make fondant? I hv seen many cakes with fondant icing bt its recipe seems difficult though. Can I substitute brown sugar with grated jaggery? will that affect the texture of the cake? meena: Yes you can substitute but jaggery gives a very nice flavour and texture. I was thinking of making a smaller cake for Christmas by using half of all the ingredients. In that case, should I also halve the oooking time of dry fruits from 20 mins to 10 mins? I baked this cake yesterday.Took a long time to make,nonetheless came out yum….very tasty.I used jaggery instead of the date syrup..how does the syrup contribute to the cake?And yes, I couldn't tell the presence of potatoes in it!Last year I had tried your fruit and nut cake around christmas:-)Thank you for this tasty recipe. Ashwini: Glad you liked the cake. The syrup gives flavour to the cake. Deepa: After 107 comments, I cannot afford to have a recipe published on my site with errors. Right? Besides this cake has been tried with great success by many. Do read the recipe properly and if you follow the instructions you will get a good cake. The baking soda has been mentioned twice because it is used twice in the recipe, once it is mixed with the dry ingredients and once into the cooked dry fruit mixture. Hope this helps. Tried out this recipe for eggless fruit cake after my neighbour gave me some for sampling. It was sooooo good. The next thing I did was make them. They r so yummy and no one would say they r eggless. thank you for such a lovely recipe. Rajashri: That's great to hear! Glad you liked this cake so much. I tried out the cake following the exact recipe and instructions but the cake turned out bitter. When i taste the cake it is mostly the fruits that are bitter…the batter tastes fine. What could be the reason for this? Sri: It is clear that your dry fruits are bitter. Walnuts if not fresh can turn rancid overtime. Or maybe other dry fruits could have the bitter tinge. Please use fresh dry fruits to avoid the bitterness. rena: Yes you can halve the recipe. Use a 6" round pan or 8" pan but with the 8" pan you wont get the height. The temperature would remain the same but the time would vary depending on the oven. Check after 45 minutes if the cake is done..if not put it for a few minutes more until done. made this cake.. it was yummy..also, thanks for your reply.. I wanted to know is there any to replace the potato…can i use cornstarch or flax seeds..pls let me know thanks a ton!! Hi anushruti…I wanted to know what is all spice poweder as u have mentioned in the receipe. rena: In this recipe, the potatoes also provide body to the cake. I have other cake recipes with cornflour on this site if you wish to replace the potatoes. Butter is mentioned twice in your receipe ,please clarify the same. shibha- 1 tbsp butter is for greasing the tin and 200 gm butter is for the cake. I tried this receipe today. I halved the given receipe and baked it in microwave at 180C. It took 30-35 mins and the cake turned out really well. I did not cover it with foil. How should be the consistency of the batter. Mine was quite thick as compared to other cakes what I have tried so far. It was not pouring consistency but thick similar to mashed boiled potato. Is it right? And why do we cover the cake with foil? I am asking this to check whether I was on right track or not though the cake was gd. Shobha: The consistency of the batter of this cake is a little thick. The cake is covered when it is baked for a long time to prevent it from burning. Since you halved the recipe you did not need the foil. Thanks for the recipe. I tried and it turn out to be a big hit among my family members and friends. Thanks again. This is great page with yummy awesome good cake. i really liked it very much. Rupa: I'm very happy to hear that. Thanks for reporting your suceess. rama- Yes you can make and send it. Make sure you pack it in an air tight container. Hi Anu..been wanting to write to you since long to tell you bout my eircpxenee on this cake.The Cake came out fabulous. This is the first time i tried out an Eggless Recipe, & I just simply followed your measurements & directions (Except i didnt cover the cake in the oven).It was an awesome cake. The batter was a little thick when i mixed it in the end, but i didnt bother much about it, just went ahead & placed it in the oven & what a an awesome cake it turned out to be. Baked to perfection, moist & delicious. Thank you for this lovely Recipe. Now I always refer to your blog for anything Eggless:). A small request, havent come across any Eggless Chocolate cake recipe. do you have any? Thanks. I just couldn't hold my myself back this time from telling you how wonderful this recipe is. I love it and so does my entire family. Its been two -3 years that I am using your recipe. i write it down every season and somehow loose it 🙁 but then i again come online to hunt for it. Though so many options available online but i couldn't find any of it better than this. So Thanks girl for the wonderful recipe that makes my Christmas worth it. Rezby- Thanks so much for your wonderful words. Made this cake today..substituted potato with pumpkin purée and it turned out great!! Just had a question – I was expecting a dense cake but mine turned out to be spongy, is that how it is supposed to be? Once again thank you so much for sharing these wonderful recipes with us! Divyangi- Potato makes a denser cake. Glad you liked it. Do you think we can substitute water with grape juice in this?? Megha: Grape juice will be tart and the recipe will have to be altered in terms of the raising agents used. Maybe you can substitute part of the water with the juice, say 1/4 cup to 1/2 cup. Let me know the results if you happen to try it. Yesterday i made this fruit cake & it tasted heavenly.But it turned out very dry & the crust was hard.What must have gone wrong?I had baked the half quantity & covered it with foil still it didn't turn out moist. nandini- Looks like you overbaked the cake. If you reduce the quantity of ingredients then you need to reduce the time as well. Thanks a lot Anushruti & Merry Christmas. I had reduced the time & had checked the cake but it was under baked so again baked it for 10 min. My batter was pretty thick i had to add little water to it. I will try it again & let you know how it turned out. I really love fruit cake especially if there's a lot of dried fruits and nuts. I cannot wait to try this at home. Great Job! the above cake i baked and the taste is wonderful. I thank you . I request you to send me eggless cookkies receipee for my grand children aged 2 years. Heyy, maturing the cake takes place at room temperature? Or do i need to refrigerate it? Shrishti- This cake need not be matured. It needs to be refrigerated. Can I substitute the boiled potato with unsweetened applesauce? Great to know that Vandana! Thank you for trying!